Few technologies have generated more excitement than autonomous vehicles (AVs), and with good reason. AVs will not only change how people get around cities, they will change cities themselves. However, AVs are not a panacea. Cities around the world should anticipate both positive and negative outcomes from our autonomous mobility future, then actively explore policies and incentives to move us toward positive outcomes. To understand the impact of AVs on the world’s cities, the World Economic Forum and Boston Consulting Group recently completed a three-year collaboration. We started by building a global community of AV-savvy executives from across the industrial spectrum, from automakers to software companies to insurance providers. To ground our thinking in reality, we decided to collaborate with a real-world city to catalyse actual testing of AVs. Additionally, we wanted to understand how consumers are likely to adopt AVs and what the impact of AV adoption would be on city streets. Boston emerged as the winner among ten applicant cities, and we kicked off our collaboration with Mayor Walsh and his transport team just under two years ago. We started by focusing on people. We asked more than 2000 Boston-area residents to choose among eight different transport options when presented with a specific travel situation (e.g., getting to work on a rainy day). Some of these eight transport options exist today, such as mass transit, personal car or taxi and ride-hailing. Some are future options, such as taking an autonomous personal car, autonomous shared taxi or autonomous minibus. We expect the percentage of Bostonians opting for mobility-on-demand services to swell from 7% of trips today to 30% by 2030. Of those mobility-on-demand rides, we forecast 87% will be in autonomous cars, taxis or minibuses. Whether they are opting for shared services or not, more and more people travelling short distances are likely to turn away from walking and mass transit, choosing on-demand vehicles instead. While most of the shift to mobility-on-demand comes at the expense of personal car trips, our analysis also anticipates a slight decline in public transport use across the Boston metro-area. Within the city limits of Boston, we anticipate a decline in mass transit use from 47% of trips today to 33% of trips by 2030. Furthermore, the shorter the trip length, the more likely consumers are to choose autonomous mobility-on-demand options. What does the increased adoption of (predominantly autonomous) mobility-on-demand services mean for cities? The next step in our research was to simulate how people and goods would get around Boston in the future, utilizing real-world data from the City of Boston and companies such as Inrix and UPS. The simulation, built by BCG’s advanced analytics arm BCG GAMMA, modelled traffic patterns across the entire city of Boston and used the results of the consumer study as the input. It took about 20 hours of computing to simulate 24 hours of traffic.The results showed that if Boston were to adopt AVs and mobility-on-demand as we expect, then overall travel times across the city would be reduced by about 4%. That’s not bad, but it’s not a radical transformation either. However, when we dig into the analysis by neighbourhood, we see that travel times in the Boston downtown core would actually increase by 5.5%. AVs will make traffic worse in downtown Boston, not better. Most of this is caused by substitution away from mass transit to mobility-on-demand surface vehicles. However, in the Boston neighbourhood of Allston, on the outskirts of the city limits, average travel times would improve by 12%. Allston is home to many students who attend nearby universities and often walk, bike or take mass transit to class. We expect the number of people commuting from Allston to downtown by personal car to drop significantly as commuters opt for shared, autonomous mobility-on-demand services. Another important finding from the simulation was that the number of parking spaces needed in the autonomous future will decline by 48%. Imagine the opportunities as we free up half of city's the on-street and in-structure parking spaces. To reduce the number of vehicles on the road, cities should implement financial incentives that discourage riding alone. By charging a higher fee for single occupancy rides, more and more people will be encouraged to choose shared transport options. We tested this theory with the simulation and results indicated a 15.5% travel time improvement, compared to the current situation. With increased use of mobility-on-demand services, fewer parking spots will be necessary. Cities could utilize the curb area as additional lanes for motor vehicle traffic and bikes, or as dedicated zones for picking up and dropping off passengers, or urban logistic zones for deliveries. 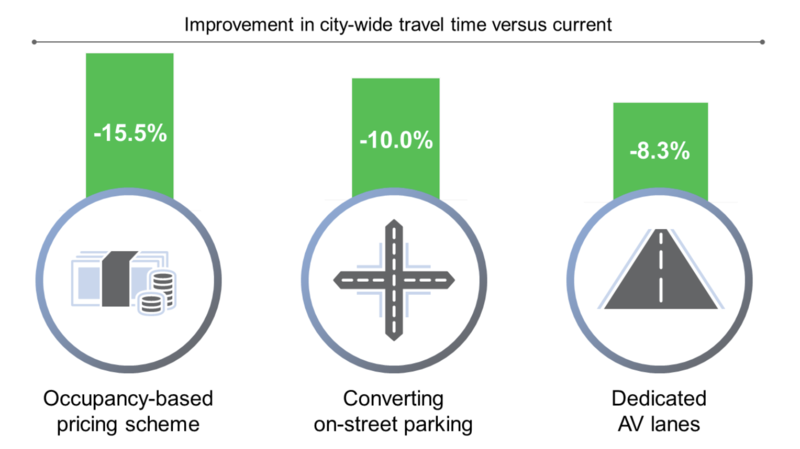 The simulation indicates that converting on-street parking will yield a 10% improvement to travel time, compared to current times. Cities across the globe have high-occupancy vehicle lanes or bus lanes to keep traffic flowing for travellers using shared mobility services. Why can’t the same be true for shared autonomous vehicles? If they could operate in dedicated lanes, travel time could decrease by 8.3%, as indicated by the simulation. Policy-makers must strategically prepare for what’s ahead now, rather than react later. The results of the simulation clearly point to a future of inconsistent benefits and challenges from autonomous transport. From the beginning, Boston was eager to complement research and analysis with in-field testing of AVs. The city hosts a rich ecosystem of talent in both software and robotics, two pillars of AV technology. In January 2017, soon after we initiated our collaboration with the city, nuTonomy began the first autonomous vehicle testing on the streets of Boston, confined to a small zone known as the Raymond L. Flynn Marine Park in the city’s Seaport district. Last week, Boston announced an expansion of its autonomous vehicle testing programme - from the Seaport neighbourhood to the entire city. How did Boston move so fast to embrace this exciting new technology? Our report highlights a number of success factors that have helped Boston elevate itself to a leader among US cities in AV technology and policy deployment. Three in particular are worth highlighting. First, Boston took the time to understand what it wanted to achieve with its transport system. The city conducted an exhaustive study, called Go Boston 2030, to understand the transport needs and desires of its citizens. The result was a clear strategic focus on three simple objectives: safety, reliability and access. Second, Boston created a tiered testing plan with clear achievement milestones. Finally, it sought to familiarize people with AVs. It deployed a concept devised in one of our workshops called "the AV petting zoo". In October last year, the city hosted a Robot Block Party that featured several AVs. As more and more cities launch AV pilots, city leaders and policy-makers should embrace this innovative technology - and with it, all of the potential positive and negative changes to the cityscape. Policy-makers must develop measures and incentives just as innovative to unlock the full potential of opportunities from AVs. The full report, Reshaping Urban Mobility with Autonomous Vehicles, is available here.